The world has lost a man who would’ve fit in quite well among our merry band of gear heads. My grandfather has a vehicular history that would be impressive spread among multiple men. As a child he spent time around both the machine shop and car dealership his father owned. The car dealership sold Dodge Brothers and Desoto at the time. Later they would add Chrysler and Plymouth after the discontinuation of the Desoto line. After enlisting during WW2 he entered flight training. He was training to fly pursuit planes. During a mock engagement while flying a P-51 he was involved in a near Miss with one of his instructors which revealed a pinhole blind spot in his vision that meant he couldn’t complete flight training and would be assigned to a stateside post. He spent the war at a naval shore battery in Oregon; Fort Stevens. Thanks to very low staffing he was part of three branches of the service depending on his job on any given day. When he was doing clerical work he was in the Army, when he was assigned to the shore battery itself he was a member of the Coast Guard, and when he was on a torpedo boat he was in the Navy. In June of 1942 the battery was attacked by a Japanese sub firing it’s deck gun. Unfortunately, the sub was out of range of the battery’s outdated guns so they elected not to return fire fearing the muzzle flash would help the submariners improve their aim. US censors released a story claiming that the only damage done was to the bases baseball diamond. They were worried that admitting what really happened would cause panic on the west coast. Even today that is the main story told. The truth is several buildings on base were hit including one of the barracks. My grandfather told me that he was playing poker in that barracks when someone ran in to report the base was being shelled. He was among those that ran out just before the shell hit. I still can’t find the exact casualty numbers, but he knows over 70 men died that night. Following the war he returned to his dads dealership and joined the local volunteer fire service. He was part of the department for almost 20 years until it became a professional service. In the early 60’s he bought a kit that was for a small open wheel race car. I don’t know the name of the exact series, but he raced at the Dayton Speedway for two and a half seasons. His time as a driver came to an end when his car blew a tire and tumbled over a guardrail. He suffered a concussion, a broken wrist, a broken collarbone, and multiple fractured ribs. My grandmother told him if he ever raced again she would take their two daughters and move in with her sister. He never drove again, but the car was rebuilt and driven by his cousin for two more years with my grandfather working the pit crew. 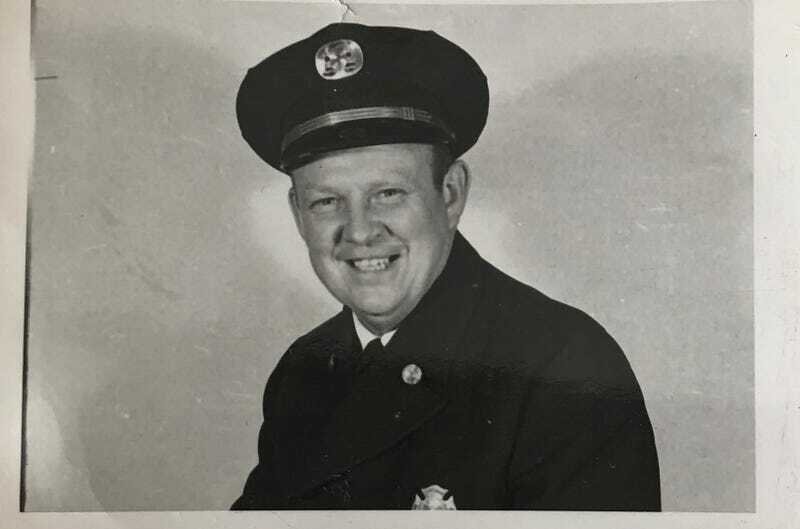 In 1967 he worked as part of the Indy 500 fire brigade. Then in 1968 he went back to work as a firefighter specifically assigned to the pits of the Lotus turbine car. In case this wasn’t enough for you. In December of 1960 after the announcement was made that Desoto was being discontinued he along with two other people from Ohio Desoto dealers went to Chrysler headquarters to try and convince them not to discontinue the line. While they were unsuccessful with this they did get official permission from Chrysler to start a club for Desoto owners. That club is still active today as the National Desoto Club. My grandfather served as their technical expert for people needing help with the Desoto and by extension the Imperial and Chrysler Airflow cars. He continued doing this until 2 years ago when he went into a nursing home. He will certainly be missed, but even he said he couldn’t imagine having lived a more fulfilling life.